Originally uploaded by Doctor J. 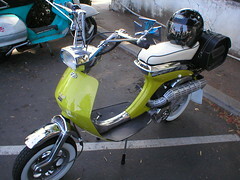 According to Doctor J, this is a 125cc Lambretta Vega. I didn’t know it came in a 125… I thought it was just a 50 and 75cc… but this thing is so pimped out he / she could have ANYTHING in there. Who owns this scoot? Can you give us the scoop? I could be wrong about the 125. I think I had just overheard someone talking about the bike at the Endless Summer rally so I could have gotten the message mixed. It does look a bit small for a 125. No idea who owns it, but I’m assuming since they were riding it around Santa Barbara (it wasn’t trucked in) that that’s where it and its owner are located. Wow, looking for a pic of a Vega and I find this nine year old post! That’s mine at Endless Summer waaaay back. I still have it. It was red with the chrome already done when I got it, pretty beat up, it had a single rider seat as well. I had it repainted it’s original color. I swapped the tank for a painted one (that tank is off a oil injected Cometa)and got a repro seat cover to match the original black. It doesn’t look quite so Viet bodge anymore (it’s not asian)It is a 125cc, a common upgrade in the early ’70′s using the barrel and piston off a J-range. I did truck it in but I do live in CA.